I mentioned how Empire did a two issue tribute to Hitchcock the other day and in this second part they did a big section on High Anxiety. I really need to see this! Thanks, Marie. You should try to see it Jon...it's really good. And there are references to some of Hitchcock's earlier movies too. I thought it was impressive too. This extra does talk about Hitchcock's sense of humor..something that has been brought up in some extras on some of the Hitchcock movies I've watched. I think that the fact that you love Hitchcock will make this film enjoyable for you Jon, but don't expect it to be as good as Blazing Saddles or Young Frankenstein. It suffers from two glaring problems. First, there really is no coherent plot to it. It's just a string of Hitchcock spoofs sewn together. Second, Mel Brooks is not skilled enough as a comedic actor to pull off the lead man's role. Mel's genius is writing and directing. He likes to break the fourth wall way too much, and it ruins the flow of the film. Originally, his part was written for Gene Wilder, and I believe that if Wilder had starred in it, Brooks would have seen the weakness in the running gag I mentioned and would have fixed it. I didn't mind Brooks in the part...though it may have been better with Wilder in the main part. It is mentioned in the one extra how there was a scheduling conflict or something like that that kept Wilder from being in the movie. Brooks just wasn't manic enough. Wilder was a genius at pulling that emotion off. That's true..Wilder was very good at that. When Scotland Yard is unable to stop the gruesome rampage of Jack the Ripper, a citizens' committee asks Sherlock Holmes (Christopher Plummer) and his trusted associate Dr. Watson (James Mason to investigate. But even if Holmes' remarkable powers of deduction can unmask the manical fiend, can he and Watson face the most shocking secret of all? Find out in this masterful suspense thriller directed by Bob Clark (A Christmas Story) that both fans and critics have called the most exciting and original Sherlock Holmes movie ever made. I decided to pick this one up recently after reading a bit about it. I hadn't seen it before. I'm glad I decided to get the movie. The plot is very interesting and I like the idea of Sherlock trying to track down Jack the Ripper. I don't know a lot about the Ripper murders, but I know enough to know that that aspect of the plot seems accurate. At least the order of the victims and the condition of the bodies. I do think there is a good amount of mystery to what is going on and a few scenes are very suspenseful. As far as I know, the plot for this one has been created just for the movie and isn't pulled from any of the stories or books. The ...resolution for the Ripper murders is very much like one that has been used in another movie I've seen featuring Jack the Ripper. From what I've read since watching the movie, the theory in the movie was taken from a book about the Ripper. I think the theory was kind of popular for a while, so that part of the plot may not be much of a surprise to viewers. I still thought the movie was very entertaining even though I wasn't surprised by the resolution Sherlock came up with. The actual attacks aren't shown that much, and there really isn't a lot of violence, especially considering the subject. More of the final murder is shown late in the movie, though it is through a grimey window, so things are obscured. The things done to the victims is talked about and those descriptions might bother some people. The versions of Sherlock and Watson in this movie are a bit different from how they have been portrayed in some of the other Sherlock movies. I really like these versions of the character. Sherlock is clearly intelligent and good at solving crimes without seeming smug or condescending. He treats Watson as more of an equal and there seems to be more of a true friendship between them. Watson isn't a bumbling fool and he even handles part of the investigation alone. Sherlock also shows much more emotion - especially compassion for others. It makes him seem more human than he has in some of the other Sherlock movies I've seen. Christopher Plummer is wonderful in the part. This is a really good, entertaining movie. Fans of Sherlock should definitely give it a chance. Have you seen Sherlock Holmes movies where Watson was a bumbling fool? I don't remember so and certainly would never picture him that way. I don't think of him that way either, though I have read that he was depicted that way in a lot of the movies. I have seen one or two - including one I haven't written about yet - where he isn't ....well...not stupid, but he is clearly less intelligent than Holmes and has to be..lead through things. I'm pretty sure we'll never know for sure who he was. The movie didn't mention anything about him possibly leaving England. I could see that happening though. As far as this movie goes, Holmes figures out who did the killings and why. I'll mention the other movie that uses the same basic idea if you want to know. The basically a fictitious character solved a real-life crime which was in fact, unsloved...? Yes, please name the other movies. This one deals with one of the many alternate Earths that DC has created. I don't know a lot about all that other than that the characters on the other worlds are at least somewhat different. This movie deals with a version of Earth that is pretty much an opposite from the world where the Justice League is. Lex Luthor is good and the alternate versions of the superheroes re villains that are part of a crime organization. I think the story is interesting, though the plot could have been fleshed out a bit more. There is more attention given to the numerous fights. The fights don't blend together as much as the ones in Superman/Batman: Public Enemies did. Even with all the fighting, the violence didn't seem as strong as it has been in some of the other DC animated movies. There are a lot of characters in the movie, and most of them aren't developed that much. Owlman and Superwoman receive the most attention and they are interesting characters. The voice cast all does well with the voices of the characters. The animation is done well. Things - including characters - do have a slightly different look. The movie has been released on DVD and Blu-ray. There is a first look at the next DC animated movie, Batman Under the Red Hood which looks interesting. There are also looks at some of the previous DC animated movies. There is a featurette on the second disc that I haven't taken the time to watch yet. I enjoyed this movie and think it is worth watching for people who like superhero movies. 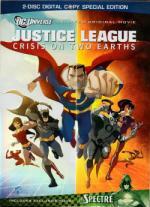 People who have enjoyed the previous DC animated movies should give this one a chance. I would have rated this one 3.5 stars at Epinions if I had the option. Since I didn't, I decided to round up to 4. I did post a review on Epinions. That is one I still need to get for my collection!